Huzzah! It’s been…a year? Poor Chani-chan gets frequently eaten by her graduate program. Being a doctoral student is not easy. So, yeah, we finally found time to watch the 5th episode together. 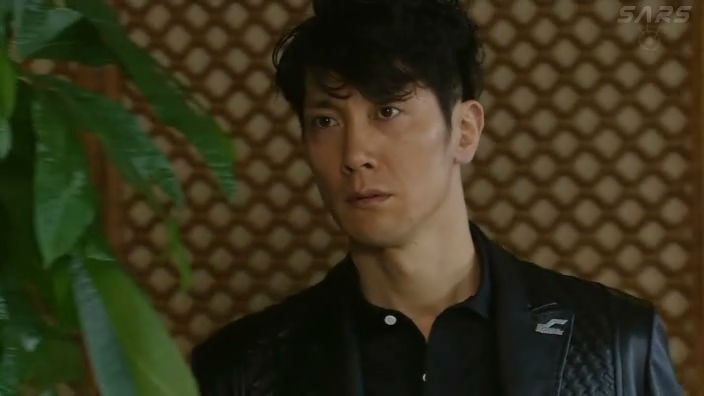 I find it very interesting to watch this drama now that I’ve seen the Taiwanese version. The Japanese version really lays a heavy emphasis on having Night/Knight act more as a robot so when he does more human-like things it stands out more whereas in the Taiwanese version, Night didn’t actually seem as roboty. Is that bad, no. It’s different. So if you remember, Night was rebooted by Mika when she kissed him at the onsen and he forgot that Riiko was his girlfriend. That led to a whole lot of trouble and misunderstandings and Riiko rebooted Night yet again to save him from a burning restaurant. Namikiri runs a diagnostic check on Night and he sees that Night’s “memory” was damaged. (Chani’s Random Note: In the manga, Riiko calls Namikiri a praying mantis in some way and a funny drawing of a praying mantis is shown. This is because “Namikiri” sounds similar to the Japanese word for praying mantis: “Kamakiri” :). 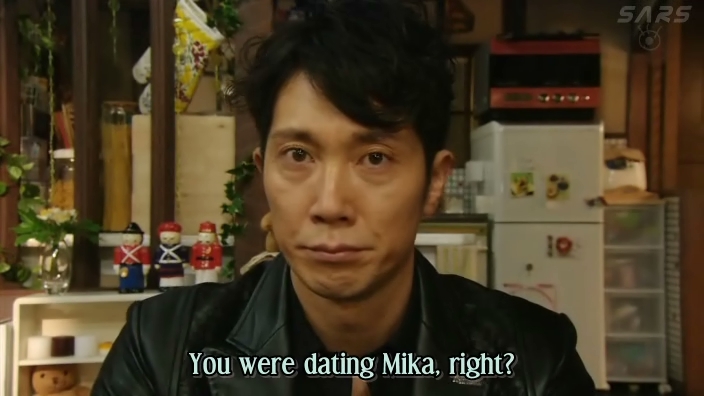 )The funny thing is that Night after being rebooted twice still remembers his past with Riiko. That shouldn’t be happening. The program is to completely wipe their memory upon reboot. However, Night recalled all of his past memories with Riiko when she rebooted him this time and he forgot only his brief time as Mika’s boyfriend. This baffles Namikiri. Just what is going on? 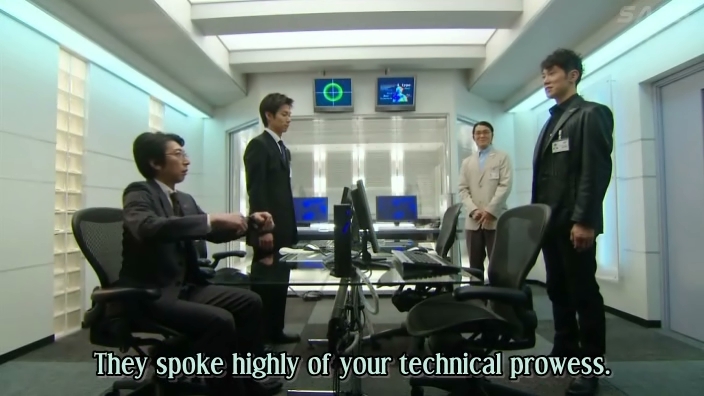 Of course, Namikiri and his assistant decide to keep what happened a secret from their boss. Thanks to what happened Riiko has to pay out a lot of money for Night’s repair fees. There isn’t much left over and then in enters the landlady who takes what little money Riiko has for rent. All that’s left is roughly $2-3 a day for food expenses. (Chani’s Note: You could so get one thing from McDonald’s dollar menu for breakfast, lunch, and dinner!) Good thing Night doesn’t need to eat, but it’s still pretty harsh. Riiko tries to talk to Mika about Night and Mika lies and says she was never interested in Night and only did what she did to force the two to make up. The office is all a buzz about Riiko’s cream puffs being selected for the Tokyo sweets exhibit at the recommendation of the chief (Soshi) himself. This makes Riiko very uncomfortable. Meanwhile, Night is looking at used tea leaves and trying to figure out if they were edible (I guess to save on food expenses). Mika comes up and he acts perfectly normal with her. So was Night just lying and toying with her then? Of course Night has no idea what she’s talking about since their brief time together has been completely erased. Mika asks if she’s better than Riiko and Night takes her hand off his chest and says he only belongs to Riiko. 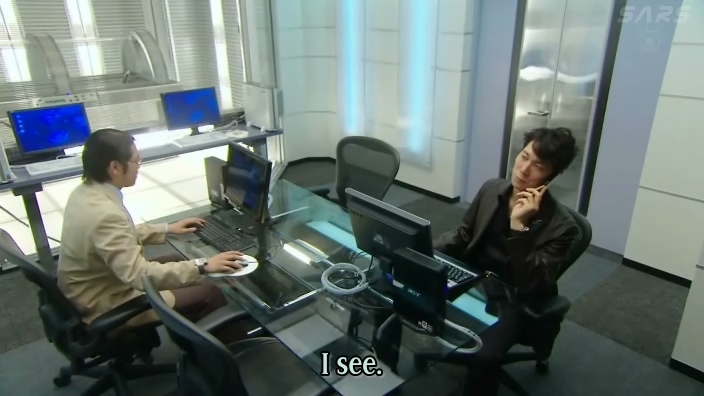 Soshi’s in his father’s office when his brother comes in. Asamoto is NOT happy to hear that Soshi’s been given a spot at the exhibit when he did not approve the cream puffs as a new product line. Asamoto-san tells his eldest son that Soshi went out on his own and requested it. All Soshi wants is a chance to prove that the cream puffs are worth while to sell. Soshi’s brother only agrees to the cream puffs as long as they can promote the new line as well. Soshi tells his brother there is no need to have the factory make the cream puffs as well—he will have Riiko make them all herself. We cut back to Soshi’s office where everyone is gossiping about how Soshi coolly accepted his suspension, but if he makes a major mistake now (even though he’s an Asamoto) he can be forced from the company. Of course, this adds pressure to Riiko. Meanwhile, Asamoto doesn’t think an amateur can make the needed amount of cream puffs, but Soshi assures his brother that Riiko can do it. 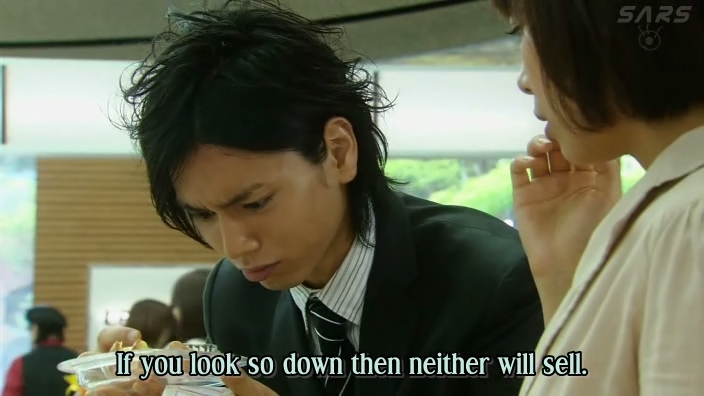 Asamoto thinks Soshi is much too naïve. 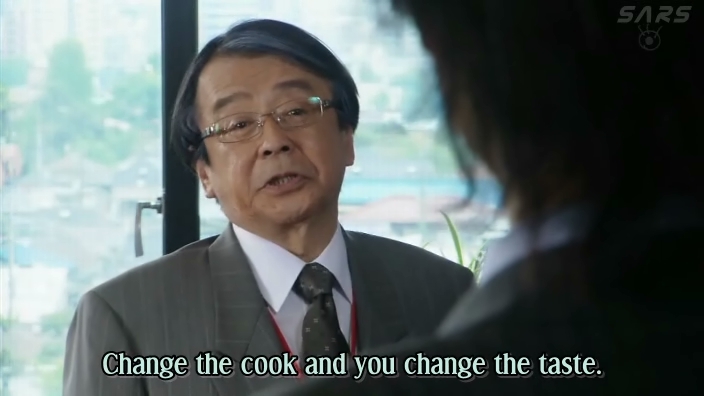 However, Asamoto-san steps into his sons’ bickering and spouts a French phrase. What does it mean? Change the chef, change the flavor. Asamoto doesn’t care and says that since Riiko is just a temp with no official license or anything, she shouldn’t be allowed to make the cream puffs. 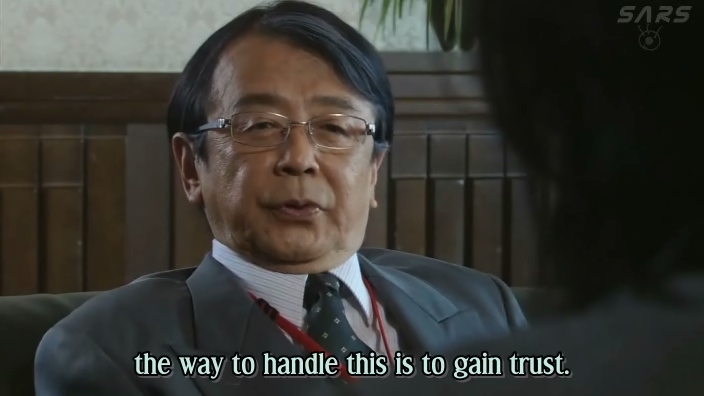 Asamoto-san asks Soshi if the outcome looks promising and his youngest son agrees. They will definitely turn a profit with the cream puffs. Riiko is shocked to hear that Soshi wants her to make 500 puffs. He wanted to make a 1,000 initially, but figures 500 will be better. Riiko isn’t confident, plus she doesn’t have money, but she quickly changes her tune when Soshi says the company will pay for the ingredients, overtime, and she will even get a cash bonus if they sell well. This makes the currently penniless Riiko very happy and she quickly agrees to help Soshi and make the puffs. The two then search for a book on making pastries when Night shows up and talks about a super sale going on. 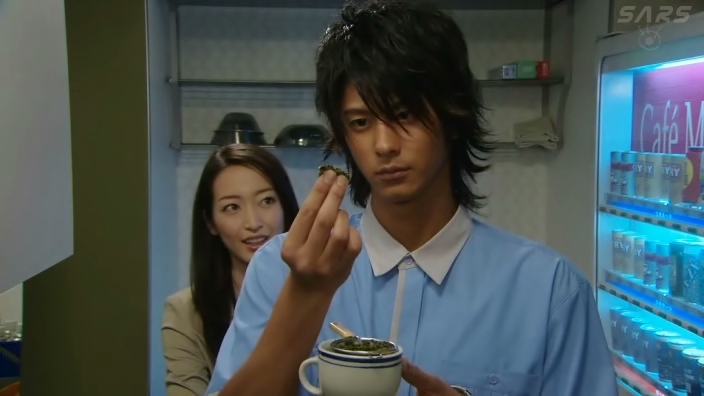 When he learns of Soshi and Riiko making the cream puffs, he wishes to help. Riiko quickly turns him down—what can he do? Soshi then accepts Night’s help since Night can help them set up the booth at the event. Then Soshi busies himself looking for the book again when he becomes the apparent third wheel to Night and Riiko. Oh, they aren’t being lovey dovey or anything like that, but it’s a bit awkward with Night’s very obvious romantic overtures. Meanwhile, Namikiri is not seeing any abnormalities in Night, but is wondering if they should replace the memory circuit just to be safe. Riiko goes to a book store with Night. She’s looking for Soshi’s grandfather’s favorite book on making pastries that they could not find in the company library (as if she has money right now :P). 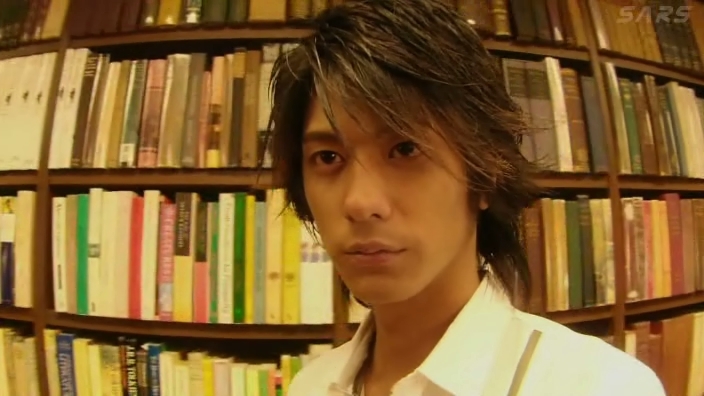 Night quickly uses his robotic powers to quickly scan all of the shelves to see if he can find the book. He successfully finds it. Riiko is happy to have him find it, but the book is 30,000 yen. (Chani’s Note: Whoa… 300 dollar book, anyone? Must be really old and rare). Riiko is horrified at the price and puts it back and you know Night won’t let it go—he’ll find a way for Riiko to get the book. At the apartment, Night shows he understands frugality at long last. He turns off the lights and they use candles from work that were no longer needed. 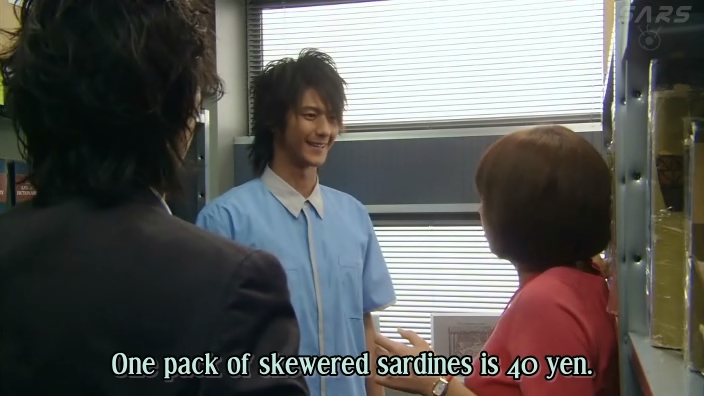 Also, they got sardines at a really cheap rate so their meal isn’t one of his elaborate masterpieces that uses up all the contents of Riiko’s fridge, but two lonely sardines. What can you do when you have no money? Namikiri then arrives to check on Night and we get to see just how alike the two are (I LOVED Riiko’s expression when she starts to understand some of Night’s mannerisms and quirkiness are basically a direct result of Namikiri being his “father” so to speak). Namikiri leaves and his smile fades. He wishes that nothing bad will happen. Setting up for the expo, Riiko is worried about going against the high end pastry chefs, but Soshi tells her not to worry about the pretty desserts. They should just do their best. Night also starts acting more and more jealous. He doesn’t like Soshi getting close to Riiko and tries to keep between them. When Riiko complains about his programming, Soshi kind of picks up on her wording and tries to ask her about it, but Night won’t let them near each other. Then Night shows his super robot strength to pick up several heavy boxes and Riiko tells Soshi this is the only time Night’s useful. The three goes to the usual bar and our favorite bartender is shocked to see all three together. Night immediately takes the drinks and starts serving customers. Soshi comments on Night’s weirdness and Riiko tells him to just ignore him. Night sees Soshi and Riiko acting all friendly and he doesn’t like it. His processor starts getting a little fuzzy and he ends up gulping down all of one of the customer’s drinks. The bartender notices this and comments and Riiko rushes over. What is going on? Night has no idea what happened. Riiko sends him to the back and watches him go with a confused and worried look. After work the next day Riiko and Soshi get ready to make their cream puffs when Night comes in for a new supermarket sale. Riiko reminds him about making the puffs. and Night is not happy to have Riiko and Soshi alone together all night. Night inserts himself and says he will help Riiko instead. Riiko apologizes for Night’s rudeness and Soshi goes to take care of the sweet boxes. Night asks why she apologized and Soshi accidentally sends the boxes crashing down. Riiko rushes over and gets a paper cut. While Soshi holds her bleeding finger Night goes off again and picks up a stack of plates and smashes them startling both Soshi and Riiko. When Riiko yells at him Night goes back to normal and has no idea what he had just done. Riiko tells him she’ll clean up and he can leave. Night’s back to normal and happily follows her orders. Soshi asks what’s wrong, but Riiko doesn’t know. Riiko calls up Namikiri and tells him what’s happening. 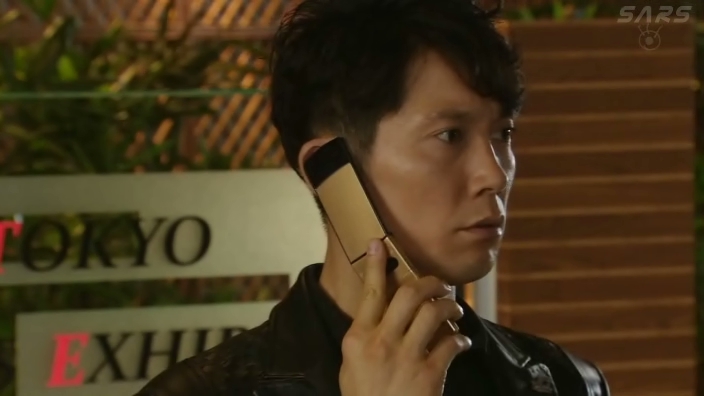 Namikiri puts on a fake smile and then lies to Riiko saying its just Night’s settings, but after he hangs up, he says this is bad. He finds Night and does a diagnostic test. Nothing weird is showing up, so is it just a temporary error? After he unplugs Night, the robot immediately runs off to the supermarket sale. Yep, he’s definitely not acting right. Unfortunately the day of the expo arrives and most people pass up Riiko’s cream puffs. Not because of the taste—they don’t even try them. The problem is that the presentation isn’t pretty enough. (Chani’s Cultural Note: Here again we have the Japanese obsession with attractive dessert items. Forget taste, food has to be cute and pretty to be eaten. Or so it would seem. When I was living in Japan they had these big pretty-looking ice cream parfaits… they’re tasty, yes, but the entire bottom half of the parfait dish is full of cornflakes. Yep, they use cornflakes as filler and the only scoops of ice cream are for the pretty areas on top, pretty much. It was so weird the first time I found that out. LOL.) Looks have nothing to do with taste and the cream puffs are not horribly unattractive. My only complaint when it comes to puffs is just what kind of cream is inside. There’s this sickening white cream that I hate. I prefer more custard-like cream. (Chani’s Note: ME TOO! :)) Of course, this depresses Riiko. Soshi tries to lift her spirits. He tells her that she looks better when she smiles and this startles her. Soshi then starts playing with her while Night watches on in complete anger. Soshi goes off to network and Riiko takes the price sticker he put on her cheek and places it on the back of her phone with a smile. The angry Night then comes over and tries to peel the sticker off. Namikiri watches. Night blacks out again and Riiko tells him to go home since he has to work for Fujiko. Yep, something definitely isn’t right. The expo ends and Soshi’s older brother tells him to give up on the puffs that did not sell well at all. Soshi doesn’t want to and his brother begs him to give up. The leftover puffs get thrown out and Riiko looks after them depressed. Soshi notices her attitude and tries to snap her out of her funk, but it was a harsh day. They sit on a bench as night falls and Soshi digs into the cream puffs. Riiko says if they can’t sell its pointless and Soshi stuffs her face with a puff to shut her up. There was a point for him to have the puffs made. He then reminds Riiko about how she always says that they must keep trying. Night is working and he asks Fujiko what he can do to make Riiko happy as it’s his mission. Fujiko says that’s a bit of an exaggeration, but she of course doesn’t get it. Fujiko then explains that Night should not think about what he can do to make Riiko happy, but to think about what he wants to do for her. Night gets this and he leaves for the night. He gets home and finds Riiko sitting at the table. He covers her with a blanket and then eats some of the leftover cream puffs. Riiko wakes up and he welcomes her home. Night says her cream puffs are the best in the world and Riiko tells him he doesn’t even know what they taste like. That may be, but they are good to him because she is his most favorite person in the world. (Chani’s Note: Okay, that is pretty heartwarming. Now if only Night weren’t a complete nut half the time). (NeeNee’s reply: That’s his circuitry going haywire and the fact that he is a robot…you can’t expect him to act like a completely sane person when it’s a program designed by us superbly flawed humans.) (Chani’s reply: I guess my point is that I don’t like his programming. They didn’t have to make him into a nut. The manga robot was a lot less nutty. So I find that choice made by the writers annoying :-p). He then notices her staring at the price sticker on her phone and his good mood is ruined. Poor, jealous Night. Meanwhile, Soshi goes back to Asamoto and looks all depressed. The next day the Asamoto have a meeting to discuss negative posts left on their message board about the cream puffs. The horrible comments stun Soshi. Who could do that? Of course big bro scolds little bro for damaging their brand and Soshi tries to defend the puffs and Riiko, but to no avail. Asamoto wishes to have Riiko fired and Soshi says he will take full responsibility to save Riiko’s job. The office staff are shocked to learn that Soshi was kicked out of his chief position because of the cream puff disaster. Mika tells Riiko not to worry too much when Soshi comes in. He’s now at a regular desk just like her. Riiko immediately apologizes and Soshi tells her not to worry. He tries to lighten the mood, but this time there is no making the girl feel better. She apologizes once more and walks away. In the office she stares at the price sticker while Night unpacks her lunch. He tells her he has a present. When she doesn’t answer, he taps her. She tells him he has no money and he says he’s working and will manage. Riiko isn’t happy about this. Night then says he’ll give it to her after work. Meanwhile, Namikiri is not happy about the mass production. He’s, of course, still keeping mum about the odd behavior of Night. Night buys the coveted overly priced book and overhears Mika talking about the horrible comments. 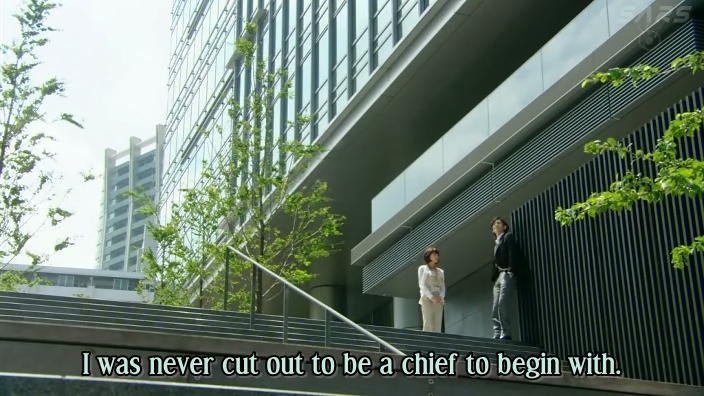 Night immediately follows while Riiko waits for him and ends up getting pulled to the new chief’s party. Night goes up to Mika and sees that she was the one posting all the horrible comments. Just as she is about to reveal Riiko’s name (up until now, the baker of the cream puffs had been anonymous), Night stops her. He tries to talk to her, but she leaves. She is almost crushed by a falling billboard sign, but Night saves her. There is no way any mere man could stop the falling sign like he did. Mika quickly rushes out and Night puts the heavy sign aright while people stare on. Night’s wrist then has problems which alerts Namikiri and his assistant. Mika asks why he saved her and Night again reminds her about how highly Riiko thinks of her. Mika notices his smoking hand and Night says it needs to be serviced soon. Mika catches the odd language and Night amends it and then tells her to stop making Riiko upset before nonchalantly going off. You can really, really see in this episode just how much Night has learned and how much he is changing. Some of it is him consciously becoming more human (like changing serviced to looked at) and some of it is his unconscious development of human emotions. The cool thing about this drama is that you really see a noticeable robot evolve into a human whereas in the Taiwanese version, Jiro Wang’s Night was never very obviously robotic. Both are interesting ways to go with the character. At the party, the negative comments were revealed and the new chief also reveals that Soshi only got demoted because he saved Riiko. 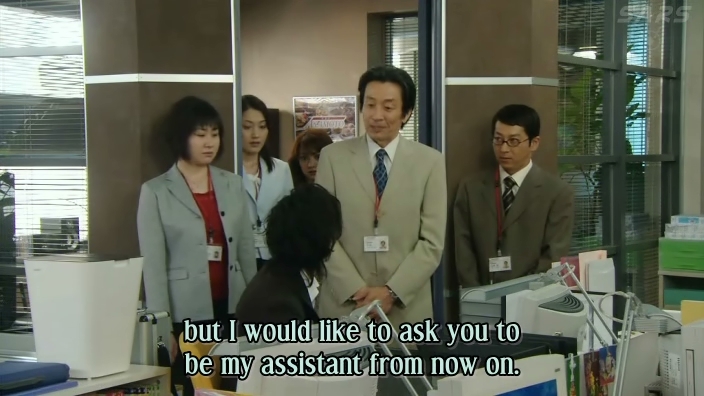 Hearing this, Riiko rushes off just as Night arrives back to the company. Namikiri finds him and asks to do some repairs, but Night ignores him since he made a promise with Riiko to give her a present. Namikiri tries to stop him and calls him 01. Night says he’s Tenjo Night and goes off. (Chani’s Note: Uh oh…) Namikiri cannot believe what just happened. Riiko rushes back to the company to seek out Soshi. Night calls out to her and gives her the present. Riiko apologizes and tells him to leave so she can see the chief. Night says he will go with her, but she angrily tells him to go home. Namikiri and his assistant come in at this time. Riiko finds Soshi sketching and reveals she knows what happened. She then asks why he did that and is shocked when Soshi says for love—he really loves her cream puffs. That threw Riiko. At first she thought he meant that he loved her. (Chani’s Note: Well, maybe he still does… :)) (NeeNee’s Reply: Maybe love is a little too strong, but he definitely likes her as more than an employee and friend.) (Chani’s reply: Actually, that brings up an important point. I’d have to double check and listen again to whether he says “suki” or “ai”, but it seems more likely he said “suki” which is more often used for “love” and more directly translated means “like”. Basically, if you tell someone “suki desu” it means you “like” them or have a crush on them. It is translated to “love” a lot in English subtitles but is often used in casual situations where you may not be necessarily head over heels in love with the person or want to marry them right now but still have a strong romantic interest in them. So he could still have meant the word he said in that case, if not the subtitled translation. If he said “ai” that may be less likely so because “ai” is actually “love” and it’s a bit strong for the subtle Japanese to use in conversation often. He also could have said “koi” which is another word for love or romantic affection but that seems less intuitive in this situation. Don’t ask me to explain, it’s just sort of a “feel” I get based on the language experience I have right now, though I could very well be wrong. Oh, and as “suki” is also used as a general “like” as in “I like movies”, it would translate best to cream puffs and would work best for a misunderstanding about what he was talking about. So I bet he used that one :).) Namikiri asks Night (who is sitting on the stairs outside the office) why he didn’t chase after Riiko since that goes against his programming. 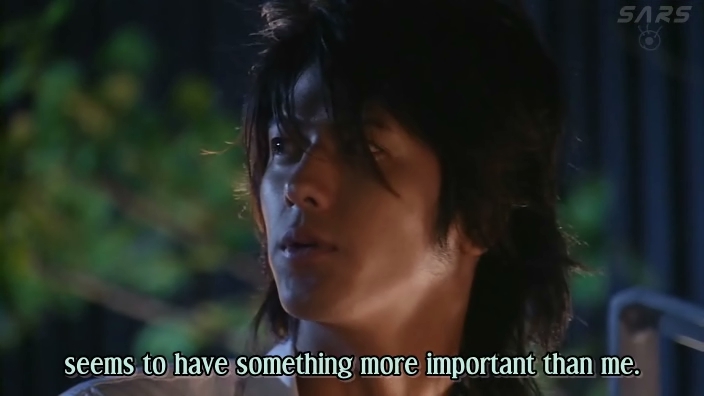 Night puts down the book and looks at Namikiri and says that Riiko has something more important than him. (Chani’s Note: Well, it’s about time Night stopped being jealous and started realizing he needs to let Riiko do what she wants). 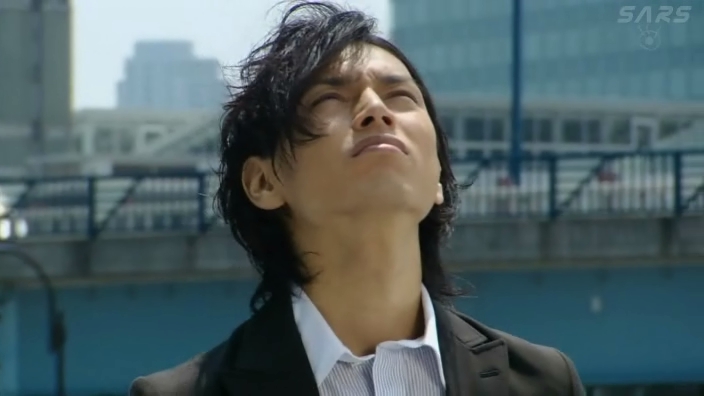 (NeeNee’s Reply: I know, but a part of my heart breaks as Night realizes this as he is like an innocent newborn baby.) Namikiri’s assistant thinks this is amazing since it’s almost like Night has real feelings. Namikiri says it isn’t his programming and hands the book back to the sad Night. 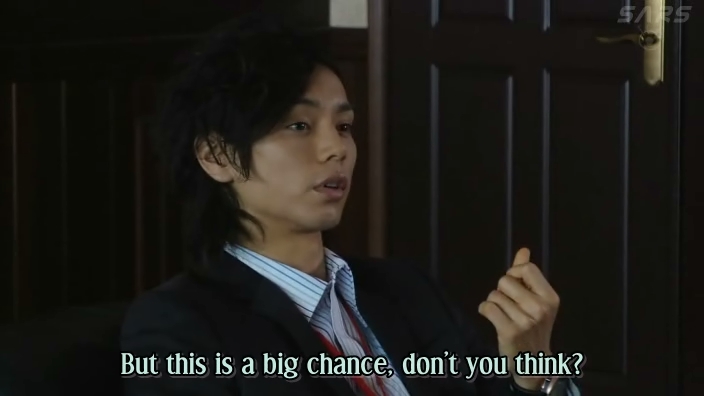 NeeNee’s Thoughts: I watched this series a few years ago and am re-watching it and recapping it with Chani-chan. I’ve also read the manga (a LONG time ago). But now I can’t help but compare this to last year’s Taiwanese drama, so that is now entering into the mix of the recaps, so please bear with me on that. 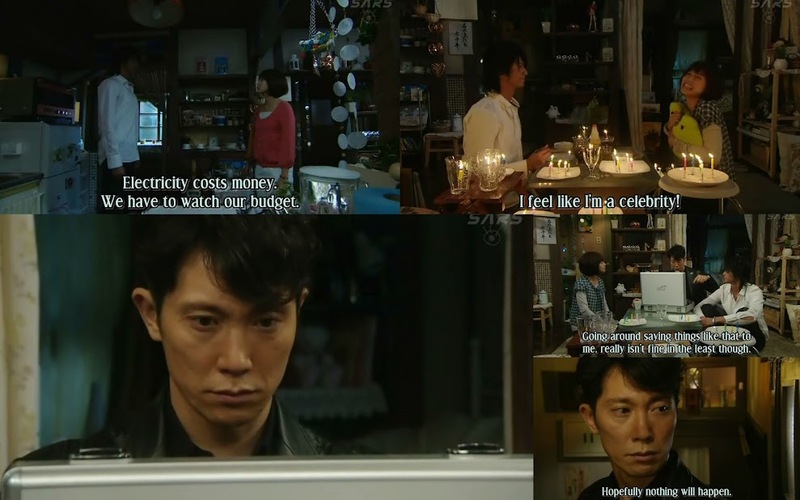 I really, really do like how differently these two dramas were done. From the get go of this series I just couldn’t imagine Riiko with Night (as much as he’s adorable cute and handsome) since they did make him so robotic. That does change bit by bit as Night does become less robot and more human, but still, in this drama you root for her and Soshi (at least I did). Apparently when doing the live action Taiwanese version, Watase Yuu gave them pretty much free reign to do what they wanted as long as Riiko doesn’t end up with Night. The funny thing is in that drama you really were rooting for a happy human-robot ending while the best friend (while awesome) just kind of didn’t fit as a love interest. So yeah. It’s really interesting seeing the contrasts and the developments and seeing how the scriptwriters and producers chose to do things differently. 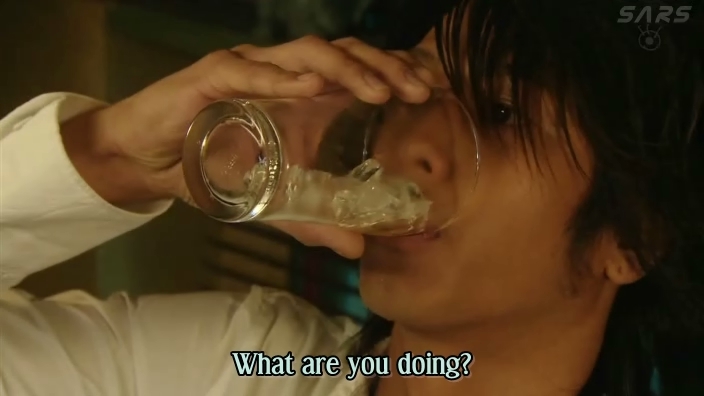 I wouldn’t trade Mokomichi’s Night for Jiro Wang’s and vice versa. They are both good in their own rights. Chani’s Thoughts: I’m glad I finally took the time to watch another episode! This series is getting to be quite fun. I find it interesting that, in contrast with the manga which sort of has the “love triangle” happening throughout, in this rendition of the story they seem to be starting off by setting up Riiko and Soshi. As of now, it seems that she’s quite interested in Soshi and not at all (or very little, minus her rebooting him after the fire last episode) in Night. I do still find Night’s overly jealous and slightly goofball programming a bit bothersome, so I can understand why Riiko wouldn’t be interested in him. If things stayed as they are now she would have no real roadblocks in the way of getting together with Soshi. But, as it has been made clear, things are NOT going to be staying as they are now. I suspect as Night starts to become more and more human his behaviors will become saner and he’ll start pulling her away from Soshi, then the real love triangle shall begin. I’m kind of sad about this because right now her and Soshi are just such a cute, ideal blossoming couple. But I suppose if we have to have… 6 more episodes I think? Well, we’ll need some conflict, so bring it on I guess. At least it’ll be interesting to watch. I’m really hoping that Mika softens a bit and eventually can become Riiko’s real friend. There have been points where it feels like she might be going in that direction but she always seems to turn around and do something despicable again (darn those falsified message board posts!). In the manga Mika’s evil nature is revealed and she and Riiko’s friendship ends, essentially eliminating the supporting secondary female character from the story. You know, now that I think of it that makes the story kind of miss something. All heroines need a female friend to turn to. At least we have the landlady and Fujiko as female presences in the drama so if we lost Mika it wouldn’t leave us quite so empty. I still hope she comes around though, now that Night has sincerely requested for her to stop treating Riiko badly. If she listened to anyone it’d be Night. Then again, the ‘nasty rival female’ character(s) in Asian entertainment very rarely listen to the guy they’re interested in when he tells them to stop mistreating the girl he likes better than her/them. Or, sometimes they do eventually but it takes a couple tries. Ah, fictional entertainment, so formulaic no matter what country produces it. I do suspect we’ll have Mika poking her nose around now that she suspects Night’s robot nature. I suppose this could either bring her and Riiko together or break them further apart as the storyline progresses. 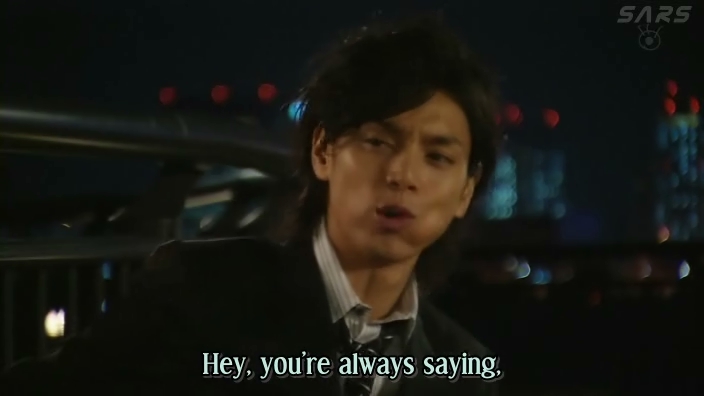 Night himself started off annoying as I said, what with the jealousy program going into overdrive and him breaking things, and his incessant goofy ‘I love Riiko’ statements that just exasperate her and bring out her comedic nature so well. But as he becomes more human he becomes more relatable. But I’ll still always favor Soshi. 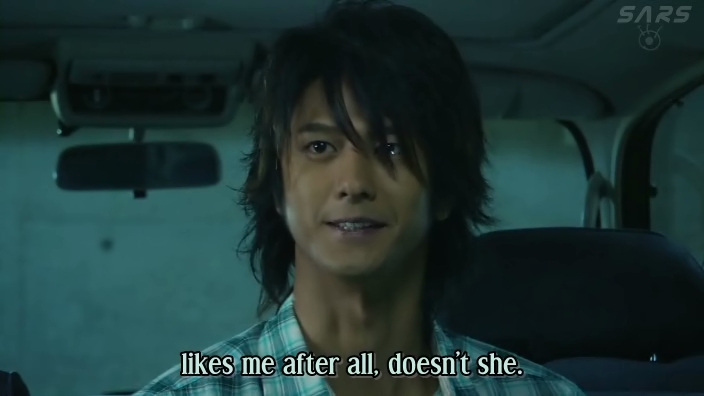 He and Riiko are soooo cute together as of late; you know they’d make a great match. Their various forms of “cream puff bonding” are priceless! I can’t wait for you to watch the Taiwanese version of this series to compare the two Nights and their programming. 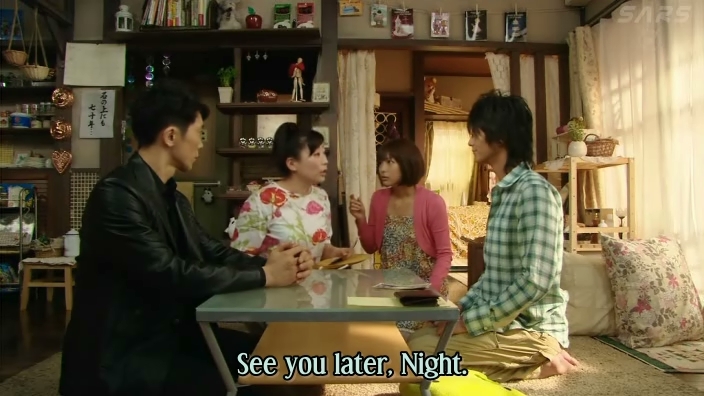 It’s interesting the way the scriptwriters took on in creating the role of Night for both dramas. Sure, Hayama’s is obviously robotic whereas Jiro Wang’s is definitely a more realistic AI. Sigh. So hard to compare two very different versions and say one is better, but given your programming complaints, I feel you might like the Taiwanese version better.